While driving to our hotel in Agra we spotted many other foreigners in equally ridiculously large tourist buses. We arrived at our hotel and went to bed, eager for the morning to come. Although it seemed that the morning came much too fast, we crawled out of bed and prepared ourselves for the sights to come, motivated by the promise of amazement and excitement. 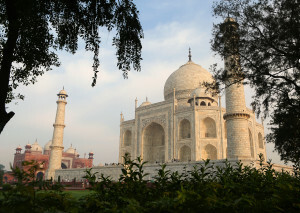 The Taj Mahal is one of the Seven Wonders of the World and the biggest tourist attraction in India. 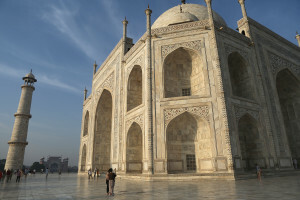 It provides a booming economy for the city of Agra. Local street merchants welcome the onslaught of foreign customers it brings to their stores. As we neared the destination, we passed countless shops, hotels, and restaurants flashing the words Taj Mahal in big bright letters. It seemed that the owners were hoping, like every other inhabitant of Agra, to cash in on the beautiful structure that was created nearly four hundred years earlier. By getting up early and going before breakfast, we were able to beat the crowds. We were some of the first people in line. We waited alongside the high red sandstone walls that surrounded the Taj Mahal complex. Passing through a few layers of security, placed to protect the monument, we found ourselves in a large walled-in complex. We entered through the East gate and our tour guide pointed out the Western and Southern gates, and the magnificent Northern gate with exquisitely carved red sandstone. The carvings were enhanced by beautiful white marble, inlaid with semiprecious stones that formed floral designs. Our excitement peaked as we looked through the gate and saw the seemingly glowing marble domes, capping the breathtaking feat of human architecture. The emperor of the Mughals, Shah Jahad, had the Taj Mahal built as a tomb for his favorite wife Mumtaz Mahal. Being one of the wealthiest emperors of the time, he spared no expense constructing the breathtaking building. As we walked up to the marble masterpiece the love Shah Jahad had for his wife became increasingly apparent, and the bar rose for all men devoted to their wives. Two identical edifices serving as a mosque and a guesthouse flanked the Taj Mahal. Looking around, the Moghuls’ obsession with symmetry was impossible to miss. 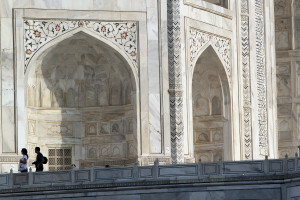 The Taj Mahal looked identical from all four sides. A long reflecting pool lay in front of the building, reminding me of the Lincoln Memorial that we had seen nearly a year earlier. Another pool was placed at the center of it, making a perfect cross. I was happy to find out that visitors were still allowed inside the mausoleum. Despite extremely tight security to get into the premises, it was very lax inside the complex. We were able to touch the Taj Mahal’s beautiful walls, feeling the slight indentations created by the semi-precious stones and their intricate designs. 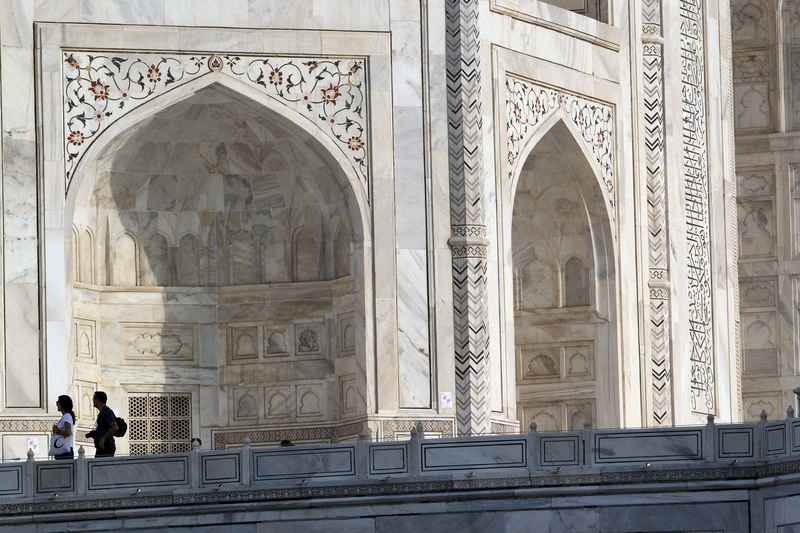 At the center of the building lay the tomb room where both Mahal and Shah Jahad rest in beautiful marble sarcophagi. I was disappointed that the structure’s four towers were off limits but understood that the complex was sinking because of upriver pollution, and the towers were not safe. As the heat continued to rise and the crowds grew larger, it was time to go. Not knowing if I would ever be able to return to see the marvelous creation, I took one last look at the edifice before passing through the northern gate and losing sight of it. The experience was truly astonishing and humbling, and it was everything I had hoped it would be. The Taj Mahal is an awe-inspiring sight. A total of 22 years of work went into building the tomb. I could see the devotion and determination that went into its creation. The symmetry was precise and beautiful. I can’t wrap my head around the fact that no modern day machinery was used to build it. On a more personal note, I felt proud that people could create something of this magnitude. The mastery of craft that went into the Taj Mahal is a lesson in what the Chinese call “Kung Fu,” complete Zen and perfection of your life. Seeing the Taj Mahal made me reflect on the India I have seen since our arrival. It is a system of fluid chaos. There seems to be so much “wrong” by American standards: hygiene, living conditions, and rules of the road. However, seeing the Taj Mahal helped me better understand India. It is a nation of wonder and cooperation. To survive, everyone has to be aware of everyone else, and every so often lend a helping hand. It was nice to be reminded that humankind is capable of wonders and that the world is a majestic place. Today we visited The Maitri Project, which is a sanctuary for abandoned widows in Vrindavan, Uttar Pradesh. When we arrived we were brought into a room where the women were singing and chanting together to the beat of drums and chimes. When they noticed us they turned and greeted us with hands in the air and sounds of exuberance. As they finished their morning aarti to Krishna, we prepared to sing for them. They were a pleasantly unusual audience to perform for. It was as if they were saying to us, “Thank you, thank you! What a wonderful gift,” without saying anything at all. The space was filled with so much happiness and gratitude. I felt like I was greeting an old friend that I hadn’t seen in a long time. Once we finished singing, they stood up from where they were seated on the ground, and approached us with hugs and smiles. It didn’t matter that there was a language barrier. The music was the form of communication, and the motherly love was so unconditional and irrevocable that it almost felt like home. I have only been truly amazed a handful of times in my life. Today was one of them. 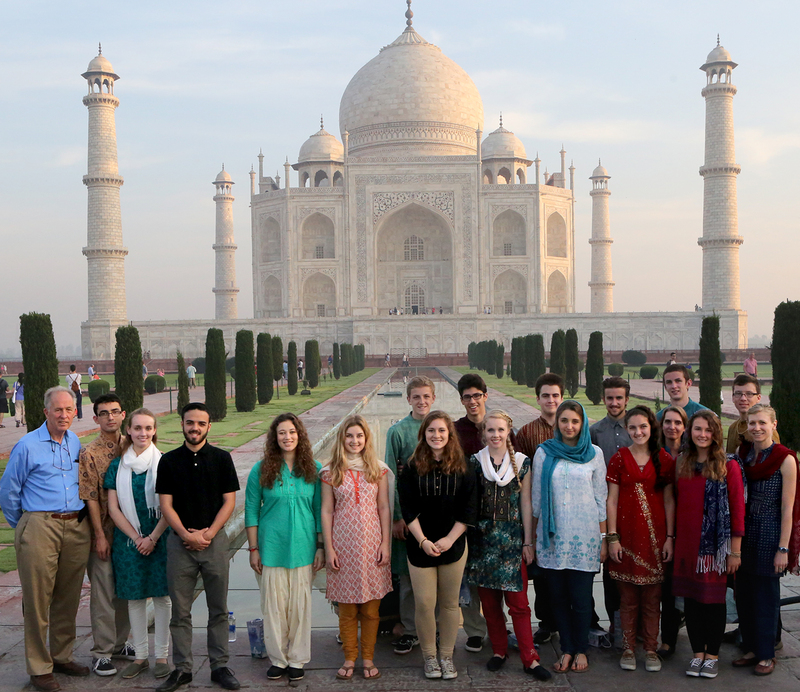 On our way back to Delhi after our Taj Mahal excursion, we stopped at The Maitri Project. 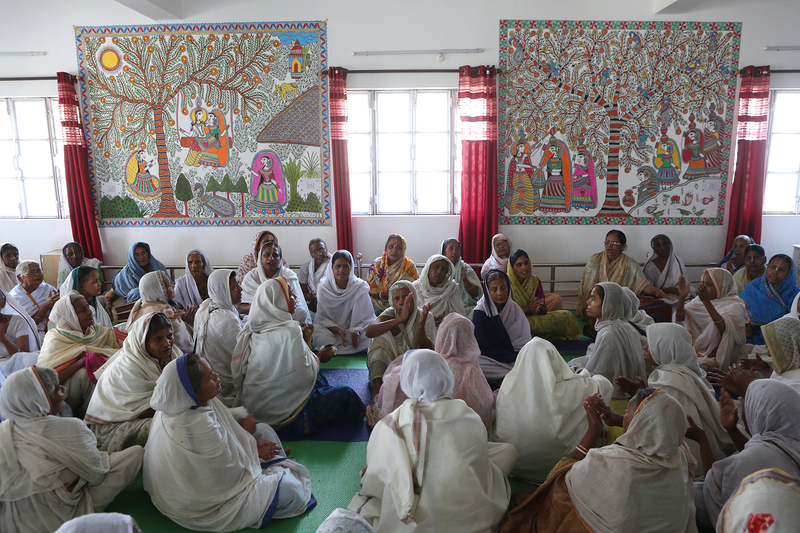 It is an ashram that is home to one hundred abandoned widows. In some places, a widow is left to fend for herself after the death of her husband. The Maitri Project provides these widows with living accommodations as well as one large meal a day. Before our visit, we knew very little about what we were going to be doing with the widows. 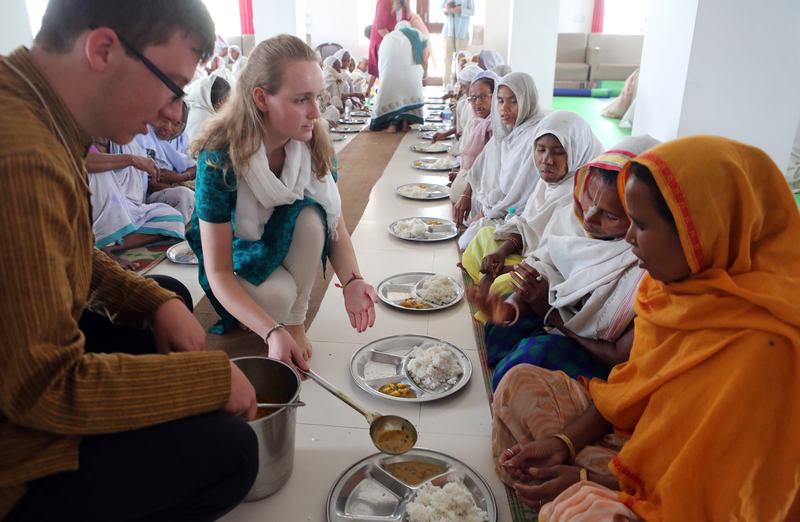 This is the first time that a Mount Madonna School class has visited The Maitri project; we were the lab rats and we had no idea what to expect. As we made our way up the steps of the building, the sound of singing and the clanging of bells drifted out of the open door. Walking in, we were greeted by the sight of 100 women seated on the floor, hands raised, singing and clapping as if they were in some sort of trance. It was a beautiful sight. After a few seconds some of them began to notice that we were there. 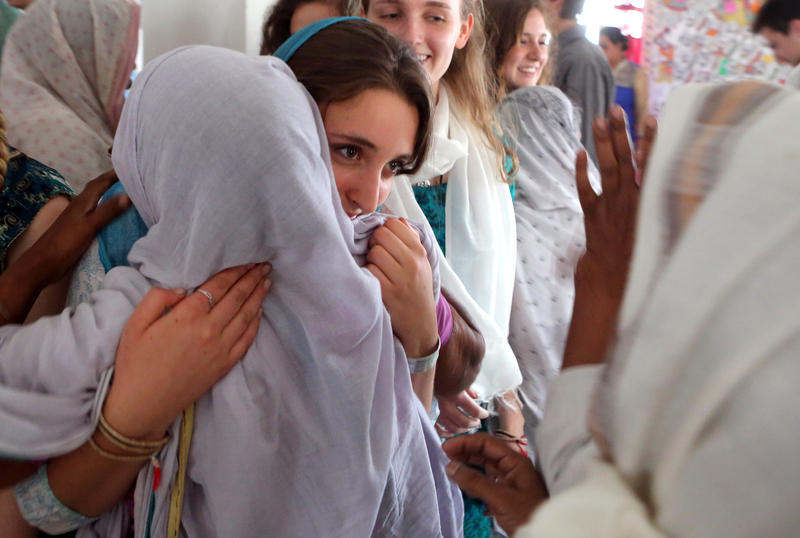 They smiled and gestured to us with namastes, but remained vigilant to the ritual at hand. A few minutes passed and suddenly they were standing, shaking their hands in the air and uttering some sort of tribal cry. Then they were back to singing. This happened several more times until the ritual was finally over and we had their full attention. With one hundred pairs of eager eyes staring at us, we proceeded to perform our set of four songs. I couldn’t contain the smile that spread wide across my face as I watched the widows clapping and swaying to our singing. During our final song, a tiny, ancient woman in the front got up and started dancing, prompting us to join her. A few more of the widows got up and we soon had a mini dance party on our hands. Not a single person was immune to the pure jubilation that exuded from that room. Laughter seemed to pour out of me involuntarily as I attempted to mimic the Bollywood moves that the women were showing us. Finally, the singing ended, the dancing drew to a close, and silence filled the room. The woman who had started it all stepped forward and grabbed Cassie, hugging her like a grandmother would hug her grandchild. With that, the remaining widows stood up and surged forward, enveloping us in a wave of hugs, kisses, namastes, and blessings. I have never experienced that strong of a surge of emotion before. I was grinning, laughing, and choking back tears as I embraced these women who I had known for fifteen minutes. In that moment, the entire room was linked by pure, unadulterated love. I was reminded of the incredible power of human connection. In that tiny sliver of time and despite a language barrier, I created a connection with a room full of perfect strangers and made a memory that I will cherish for years to come. For more info on the Maitri project, click here.